ONI Bureau: In an unprecedented one-on-one interview with Arnab Goswami in his show ‘Nation Wants to Know’, Kendrapara MP Baijayant ‘Jay’ Panda, who recently resigned from the party, has spilled the beans and accused the party of deviating from its original principles. Jay Panda slammed Naveen on various issues, saying the CM did not call him up when he was attacked with eggs, stones and bricks in Mahanga last year. He made it clear that the attack was carried out by BJD workers at the instructions from the top. Baijayant Panda linked his resignation to Naveen’s snub to his late father. “Not only he did not turn up to pay last respects to a person, who was Biju Babu’s close friend as well as an eminent figure in the state, but also restrained other BJD leaders from doing so. I was hurt at the pettiness and mean-mindedness the party showed. There was nothing left for me in the party and I had to quit,” he added. Jay Panda alleged that BJD deviated from its core principles on which it was founded. “Things are not the same in BJD in the last 3-4 years. A coterie led by a serving bureaucrat has taken control of the party & the party President. People are not even allowed to meet Naveen directly. Whoever rules, it’s Naveen Patnaik who is elected by the people and he is answerable to them,” he added. However, when asked about Arnab whether he thinks Naveen has become a “Puppet CM”, Jay Panda said it’s for people to see and judge. He accused the Bureaucrat of collecting political funds & distributing tickets, citing many leaders who spoke out in recent months. Baijayant rejected the allegations that he was colluding with BJP to break BJD. “My intent is not to break any party or split votes. I don’t want to fight with anybody. I just want to bring good governance to Odisha. That’s the only goal”, he said while adding that he has kept all options open on joining any political party or floating a new one. While responding to the allegations of his being pro-Modi, Baijayant Panda said he had been praising Modi even before the latter became PM. “I have been advocating Aadhaar, GST, anti-VVIP culture etc for over a decade. I always wrote and spoke on favour of these issues. How can I change my stand and start talking against just because a political opponents is implementing those? PM Modi has championed the things I believed in. So, I appreciate and praise him”, he added. When asked about the Grand Alliance at the national level, he said, “In my opinion, Mahagathbandhan will require a lot of sacrifices if all opposition parties come together, I think they may throw a few challenges to BJP, but Congress will have to give up good number of seats”. “I am always for Odisha, I am for India. My goal is development and positive changes. My agenda is very much clear. I have built a credible track record of suggesting changes for development. I never hankered for any position. Any post that I may get in future, would be incidental. But, my focus won’t change”, he said. 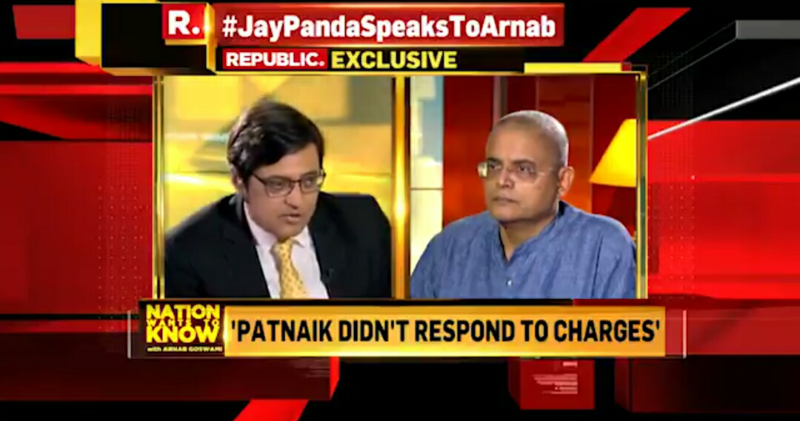 Despite trying his best, Arnab could not extract from Jay Panda which way he would go. While acknowledging BJP as the No. 2 party in Odisha, Jay Panda reiterated that he is open to all possibilities whether BJP, Congress or floating a new party.